I was hesitant to pick this book up at first as the topic matter of this book is also not what I normally read. With all of that in mind, I was fairly cautious going into it, but I was thoroughly surprised by how much I enjoyed We Sinners. The book was highly captivating and interesting, locking my interest from the first page with a beautiful story and a very talented author. The orange of the cover is very bright and unique in the universe of covers. 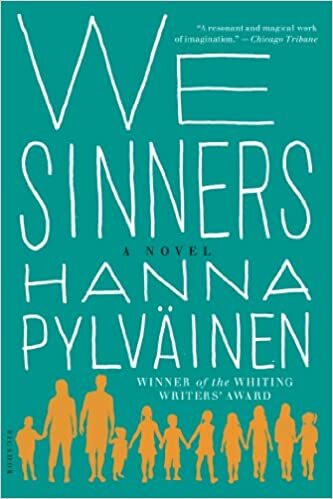 The only imagery on the cover is the eleven silhouettes of all the members of the Rovaniemi family, placed behind the text for a subtle effect with a significance that can only be understood by those who have read the book, to everyone else, it just looks like a jumble of silhouettes. The font for the title is the main focus of the cover, it runs over top of the shapes of the Rovaniemis and draws the eye to it right away. I really like the cover, it’s nothing too flashy, but it still connects to the story within. The main cast of the novel was the Rovaniemi family of eleven. They were a very traditionally religious family: no television, dancing or drinking. They attended church on a regular basis without ever missing a single day, most of their socialization was with families who were also in the church and it was expected that the nine children of the family would remain with the church for their entire life. Needless to say, there were several of the children who were questioning their faith both in school and after they finished. These struggles were very, very interesting to read about and they made up the majority of the book. There was only one character that I didn’t enjoy as much as the rest: Brita. She didn’t consider other lifestyles and was fairly judgmental towards her siblings that made decisions that differed from hers. The rest of the characters were well developed and believable and much more enjoyable to read about. There were an abundance of points of view utilized in the telling of the story. In each of the eleven chapters a different point of view was used (except for the one or two characters that were repeated). Having so many points of view was a bit confusing to start with, but I was able to fall into the rhythm of the book fairly quickly after the first few chapters. Each point of view showed a different outlook on the religion, some of the characters knew they wanted out of the church, some were wavering, and some were going to stay no matter what. The best part of the book was that the author didn’t show a strong opinion for quitting or staying with the church, she showed justified reasons for both options and left it up to the reader to decide their feelings on the matter. The plot takes place over a long period of time, following the children through school and into adulthood. This large spread of time allowed for the change in perspectives that the characters underwent to be featured as they matured. I give We Sinners a 4/5. I’d recommend it to mature teens and adults because it is mature subjects covered in the story. If you’re looking for a book that covers religious issues from a unique set of perspectives that is delivered with grace and courage. There seems to be at least one toxic Brita in every family 😉 Excellent review! I don’t think I’ve ever read anything like this one. Great review. Great review. I avoid religious books. Lovely review though I don’t feel this is a book for me. I religiously avoid such books as they touch a nerve close to home. But great review. Great review, this is actually the first time I have heard or seen this book, I am really glad you overall enjoyed reading this book. Thank you so much for sharing your awesome post.